This has been sitting in my draft folder for a year (?! ), so I’m publishing now because there’s no time like the present. 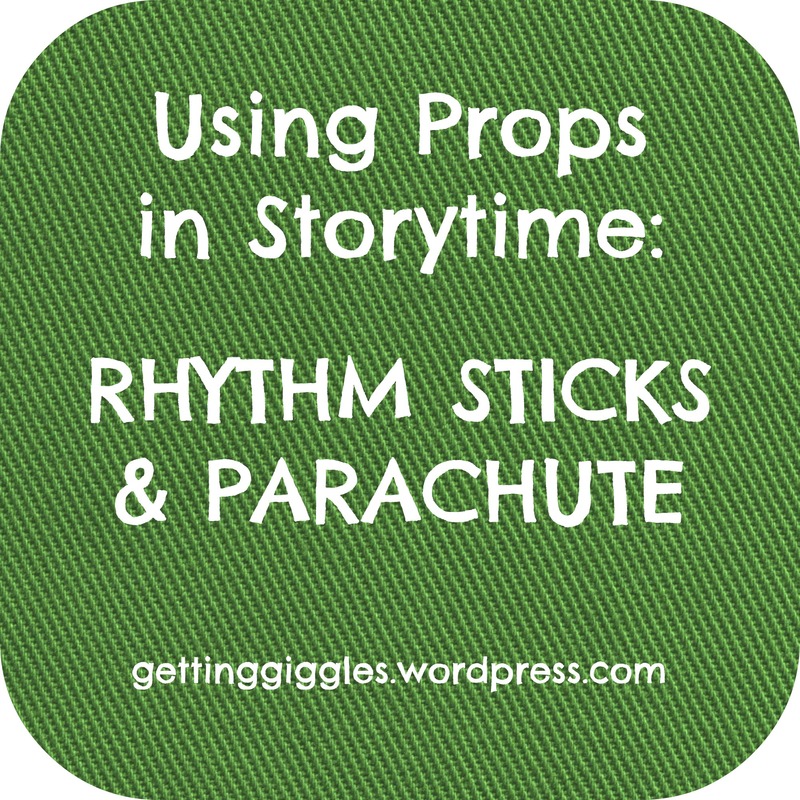 This is the third post in my series about using props in storytime. The others featured shakers and scarves. These work best with older preschoolers and even early elementary school students. I use these far less than shakers and scarves, but when you have the right crowd the kids have a great time with them. Pro tip: know your crowd before busting these out. I’ve had too-young preschoolers get kind of lost with these. With scarves and shakers, I usually have the kids come up to get one and go back to their seat. With rhythm sticks, I walk around handing out two sticks to each child; one is smooth and the other has ridges. Then we familiarize ourselves with the sticks by exploring the different things you can do with them, like tapping them together, tapping them on the floor, and rubbing them together (which makes a cool noise because of the ridged stick). Us your imagination and pretend to use them as different things. You might pretend they are magic wands, mixing spoons, oars (perhaps while singing “Row, Row, Row Your Boat”), etc. Ask the kids for ideas, too! Sing “If You’re Happy and You Know It” with the sticks. You can tap your sticks, tap the floor, rub your sticks (together), etc. Recite a nursery rhyme while tapping the sticks on the floor to the beat. For example, tap to the rhythm of “Jack and Jill.” When Jack and Jill fall down, hold the sticks in the air, parallel to the ground, and twirl them downwards one at a time. Kendra at Read Sing Play has a fun song called This is the Way We Tap Our Sticks. Johnny Works with One Hammer is a song I like to use with or without the sticks; when I use the sticks we pretend they are hammers as we sing the song. Really, you can tap to any favorite song. Try tapping along while singing the Alphabet Song. Bonus tip for using sticks with older kids: A librarian friend took rhythm sticks on a visit to an elementary school classroom. She read a version of The Billy Goats Gruff and the kids used the sticks when the billy goats went trip-trapping over the bridge. It was well-received by the kids! Note: There are CDs of rhythm stick songs, but they seem to be either for slightly older kids than my audience (early elementary) or for a setting where you’d be using them regularly. There aren’t any that I like enough for the library setting to recommend. I had just started using the parachute before I left my last job, and I haven’t purchased one at my new library. I only used it a handful of times, so I won’t pretend to be an expert (yet!). But I’m intrigued by them and wanted to give them a little shout out. I was nervous to try it the first time, but once I did I realized how fun and different of an activity it is. I’ve found these posts by Kendra at Read Sing Play to be really helpful in figuring out how to use the chute. And Jbrary has a roundup of other blog posts that will give you a lot more ideas.